AARP Foundation's award-winning Experience Corps program matches seniors with local K-3 students. These volunteers are more than just tutors – they are mentors. 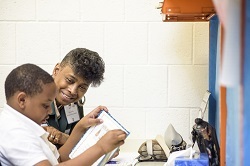 As they help struggling students improve their literacy and chances of long-term academic success, they're also sharing their love of learning and a lifetime of experience, and building new connections with their communities. Will you help drive this important work forward with a charitable, tax-deductible donation to AARP Foundation Experience Corps today? Simply fill out the form below to make your gift. Please keep in touch with me by e-mail about AARP activities and events.